Alenush Terian was born in 1920 to an Armenian family in Tehran, Iran. After graduating in 1947 from the Science Department of the University of Tehran, she began her career in the physics laboratory of the same University. She was promoted the same year as the chief of laboratory operations.In france 1956 she obtained her doctorate in Atmospheric Physics from Sorbonne University. Upon this she returned to Iran and became Assistant Professor in thermodynamics at University of Tehran. Later she worked in Solar Physics in the then West Germany for a period of four months through a scholarship that was awarded by the German government to University of Tehran. 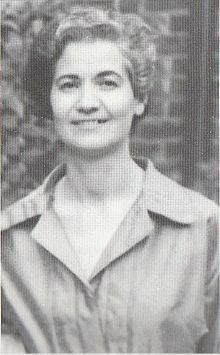 In 1964 Dr Terian became the first female Professor of Physics in Iran. In 1966, Professor Terian became Member of the Geophysics Committee of University of Tehran. In 1969 she was elected chief of the Solar Physics studies at this university and began to work in the Solar Observatory of which she was one of the founders. Professor Terian retired in 1979. She proved to the world that not only being a women, but also being part of a both a ethnic and religious minority. You can succeed. The Armenian scientist was honored during a birthday ceremony in the Iranian capital, to commemorate the 90th birthday of Iran’s first female astronomer, physics professor and founder of modern Iranian astronomy. Members of the Iranian Parliament and more than hundered Armenians paid tribute to the Armenian scientist. “She always said she had a daughter named sun and a son named moon,” said lawmaker Hassan Ghafourifard, Terian’s former student at Tehran University. Alenoush Terian passed away in March 4, 2011 at the age of 90 years. This entry was posted in Minorities, Personalities, Science, Women and tagged Armenian, Christians, Minorities, Photos, Science, women on March 8, 2014 by socialinform.